Lemonade Gift Cards are Perfect for the Holiday Season! If you’re starting to feel overwhelmed by gift shopping this holiday season, consider a Lemonade gift card. This holiday gift is pretty universal and works for just about every friend or family member on your list. 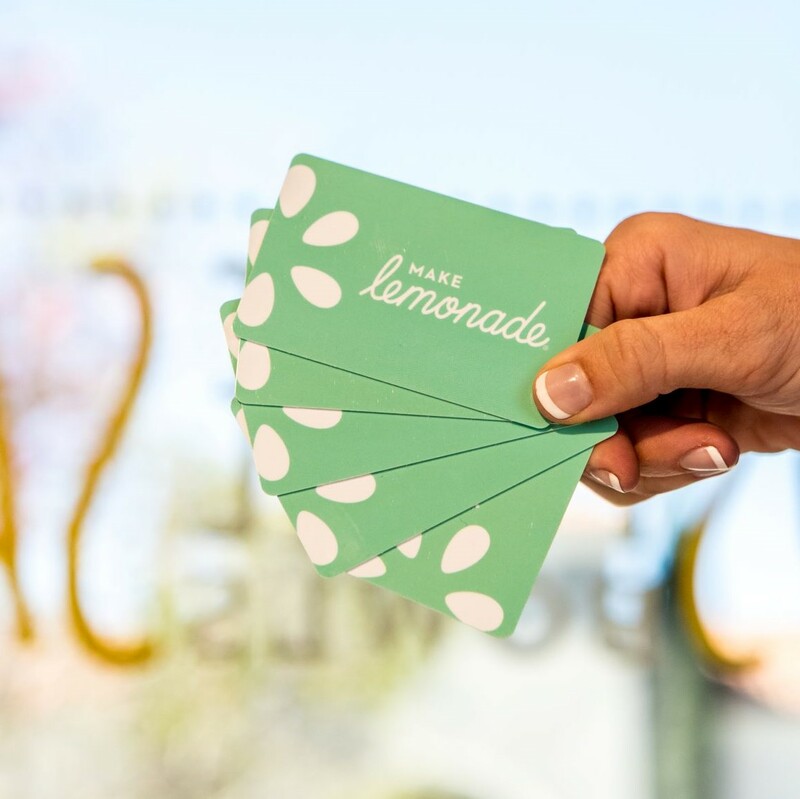 You can purchase our cutely designed gift cards to any of our Lemonade locations (except USC & LAX). Find out why a Lemonade gift card is the perfect holiday gift for food-lovers, health gurus and homebodies alike. Read below! Plus, now through December 31st, 2018, receive a $5 Bonus Card for every $25 in gift cards purchased! These are valid on all in-store and online gift card purchases. The $5 Bonus Card is valid for dine-in or takeout from 1/1/19 – 2/28/19. To learn more or get started, visit our Lemonade Stand! There’s nothing worse than giving a gift that goes sour. A Lemonade gift card is the perfect gift for a loved one that loves food. Our unique and extensive menu options change ongoing with the seasons and can suit a wide range of palates. From sandwiches and salads to our desserts and beverages, Lemonade has a little something for everyone. Learn more about our seasonal menu options here. Wouldn’t it be nice to receive a delicious holiday treat this gifting season that doesn’t come loaded with calories and a guilt trip? If you think so, then so might your friends and family who like to eat clean and stay trim during the holidays. With a Lemonade gift card, you’ll be able to give your healthy friends the option to eat out at one of our Lemonade locations to order a seasonal menu item that fits their health needs. Want to know more about our nutritional information? Find out here. There’s nothing like curling up on the couch with a delicious meal to watch a favorite show. And we bet the homebody in your life would agree. Make it easy for the homebody with a Lemonade gift card which can be used online to order takeout. Save time and get back to your flick with our online ordering option. Give a Great Holiday Gift with a Lemonade Gift Card Today! We know picking holiday gifts can be tough with friends and family having unique interests and tastes. A Lemonade gift card makes life just a little easier because it can satisfy everyone on your gifting list. To order a Lemonade gift card, simply purchase one online. If your loved one doesn’t live near a Lemonade location, check out our other holiday gift ideas that are equally as awesome, such as our Lemonade Cookbook. Happy shopping!